The Piper PA-28RT-201 Turbo Arrow IV is a single engined, low wing, four-seater aircraft with retractable undercarriage. In the early 1950’s Piper began investigation a replacement for the ageing PA-22 Tri Pacer. In 1958 the decision was taken to design a completely new aircraft designated as the PA-28. Designers John Thorpe and Fred Weick were hired and a new factory was built at Vero Beach, Florida. The Piper PA-28 Cherokee single engined, low wing, fixed undercarriage, four-seater aircraft was flown for the first time on 14 January 1960. The first prototype, N9315R, was powered by a 112kW (150hp) engine. The first production model, a Piper PA-28-150 with a 110kW (150hp) Lycoming O-320-A2A engine flew on 10 February 1961. Initial production aircraft were next to the PA-28-150, the PA-28-160 powered by a 120kW (160hp) Lycoming O-320-D2A engine. The PA-28 Cherokees were introduced in 1961 as replacements for Piper's PA-22 TriPacer and Colt. Unlike the PA-22 series the new PA-28 was a low wing design with metal construction. From 1962 a 135kW (180hp) version was added to the lineup. The 127kW (235hp) flat six Lycoming O-540 powered Cherokee 235 was introduced in 1963. In February 1964, a further version of the Cherokee was announced, the two seat PA-28-140. This PA-28-140 side-by-side two-seater was intended primarily for the training role and was powered by a 140 hp Lycoming O-360-E2A engine. Over the years, subsequent variants entered the market, include the Cherokee B and Cherokee C, the 180D, 235C, 140 Flite Liner two seat trainer PA-28-140, -180F, -235E, PA-28-180 Cherokee Challenger and PA-28-235 Cherokee Charger, the PA-28-180 Cherokee Archer and PA-28-235 Cherokee Pathfinder, PA-28-151 Cherokee Warrior which introduced the new tapered wing that would become a feature of subsequent PA-28s, PA-28-181 Cherokee Archer II and PA-28-236 Dakota (the Cherokee prefix was later dropped for the Archer II and Warrior), the PA-28-161 Warrior II, PA-28-201T Turbo Dakota and PA-28-161 Cadet. Next to these the larger PA-32 and the retractable undercarriage variant of the Cherokee, the PA-28R Arrow, entered production. In 1991, the original Piper Aircraft company filed for Chapter 11 bankruptcy. In the early 1990s, small numbers of Warriors, Dakotas and Archers were built. In 1995, the company emerged from Chapter 11 bankruptcy and was renamed The New Piper Aircraft Company. As part of the end of bankruptcy protection, the company was sold to Newco Pac Inc., itself owned by Piper's creditors and a Philadelphia-based investment firm. In 2006, the New Piper Aircraft Company was renamed Piper Aircraft. The company currently produces the Warrior III, the Archer III and the Arrow. More than 30,000 PA-28’s have been built up to date. The Piper PA-28RT-201 Turbo Arrow IV c/n 28R-8231048 was registered N8205H in the USA. After registration N8205H was cancelled as exported to Switserland; the 1983-built aircraft was registered HB-PHK in Swiss with Motorfluggruppe Basel. 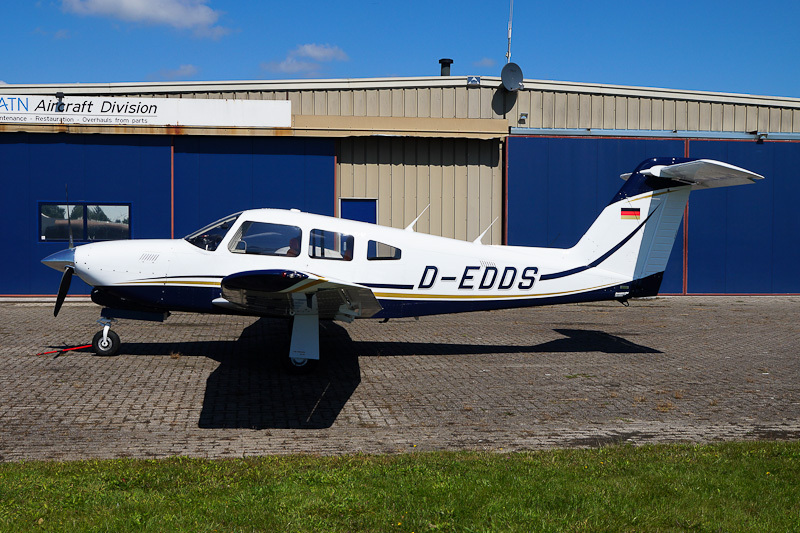 After registration HB-PHK was cancelled as exported to Germany, the Piper PA-28RT-201 Turbo Arrow IV was registered D-EDDS in Germany. Despite the aircraft is registered in Germany, it was for many years owned by Wildeboer Beheer and based at Groningen Eelde Airport airfield in the Netherlands. Piper PA-28RT-201 Turbo Arrow IV D-EDDS is powered by a turbocharged 149KW (200hp) Continental TSIO-360-FB engine. On 16 August 2016, the aircraft was seen at Hoogeveen airfield.